The fight for control of the RIA technology integration hub is well underway as the first quarter of 2015 comes to a close. Vendors have been marshaling their forces to grab this critical territory on the advisor’s desktop; the dashboard that acts as a gateway to all their other systems. Unfortunately (or fortunately, depending on your point of view), there is no light or dark side to this battle. No option is obviously good or obviously bad. The value of any of the choices is relative to the needs of the RIA making the decision. 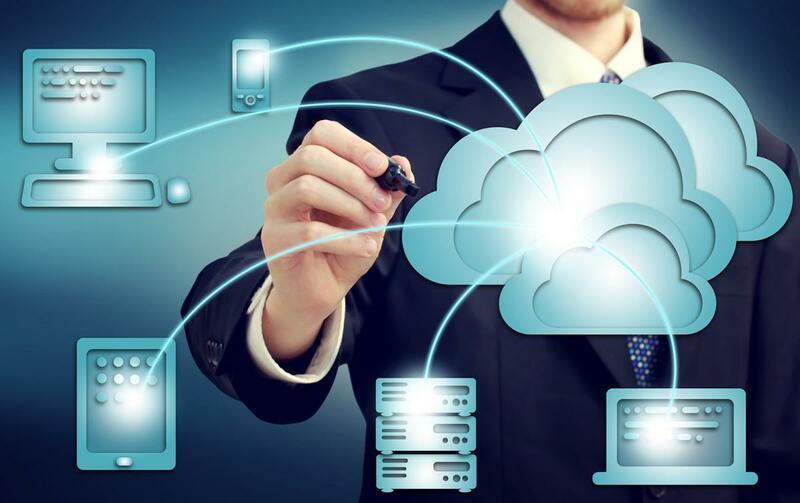 Ever since the tech bubble of 2000, almost every RIA technology solution has moved into the cloud. What the vendors often left behind was tight integration with other software and data sources. Advisors were inundated with seemingly endless streams of data from the myriad of different portals and applications that were now required to manage their firms. The demand was made that one application act as the central control point to which all other applications would integrate. This integration hub concept has taken off, with numerous vendors now offering solutions. The question now is, which key technology component should advisors choose to be in charge? There are three applications vying to be king of advisory technology; customer relationship management (CRM) software, financial planning applications and custodial systems. Each one encompasses different aspects of an advisor’s workflow and has different advantages and disadvantages to taking over as the hub. Do you have a well-defined process for contact management? Do you maintain assets at more than one custodian? The winners of this battle will have tremendous leverage over other vendors. Being the hub means that everyone else has to integrate with your system. The hub vendor becomes much stickier and has a deeper relationship with the RIA. The vendors who plug into the hub become more like replaceable components. They can be swapped out for a similar product without much effort required. This puts a tremendous pressure on all vendors to win the battle and become the hub. The downside could be lower client engagement levels and a slow decline in market share. No software company in this market environment can afford to allow this to happen. CRM software is an important tool for any RIA since it supports prospecting and lead generation, both of which are critical to a firm’s growth. It also is the repository for all client contacts and interactions. If all interactions are entered into the CRM, it acts as an insurance policy for potential compliance issues. According to a 2014 Fidelity RIA Benchmarking Study, those firms identified as “high-performing” were twice as likely to use their CRM systems to monitor their pipeline and keep their referrals up-to-date. These firms were in the top quartile in terms of compound annual growth as well as profitability and productivity. 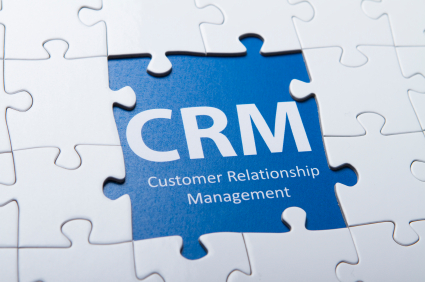 They would most likely benefit from choosing their CRM to be their technology integration hub. RIA’s that have a defined methodology for contact management and/or have a target client profile will also benefit from this choice. Their advisors will spend more time in the firm’s CRM that they would if they outsourced prospecting and lead generation. Michael Kitces wrote an excellent analysis of this subject in his blog post, Can You Outsource Prospecting For Clients? Salesforce.com, which is the leading CRM provider with 2014 revenue of $3.8 billion, is one of the most extensible cloud-based platforms on the planet. Their AppExchange provides developers with powerful tools to integrate their applications into the Salesforce ecosystem. There are tens of thousands of programs to choose from and they can be deployed across an entire firm with just the click of a button. There are also a number of vendors who have built their wealth management offerings on top of Salesforce. These include RedKite, AppCrown and XLR8, all of which offer seamless access to data from any other product that is built in the AppExchange universe. Another strong group of contenders for the title of RIA technology integration hub are financial planning applications. RIA’s plan to spend 31% of their technology budget on financial planning tools in 2015, based on the results of a survey by TD Ameritrade Institutional. This is slightly more than the 29% they plan to spend on CRM systems. MoneyGuidePro has always had a serious commitment to an open platform with well-documented programming interfaces and support for other vendors to swap data with their system. They currently list 44 integration partners on their website, which is still more than eMoney, but not significantly so, which was the case in the past. Although different entities will continue competing aggressively in their quest to become the advisor nucleus, the market is too saturated for a clear winner to emerge. eMoney Advisor, flush with Fidelity capital, has the potential to grab the lead, using its parent company’s brand identity and institutional scale to penetrate markets that were once out-of-reach. Each of the big four RIA custodians (Pershing, TD Ameritrade, Schwab and Fidelity) provide some level of integration with external applications. Firms that only use a single custodian would benefit the most from leveraging these offerings, since none of them support accessing accounts held anywhere else. 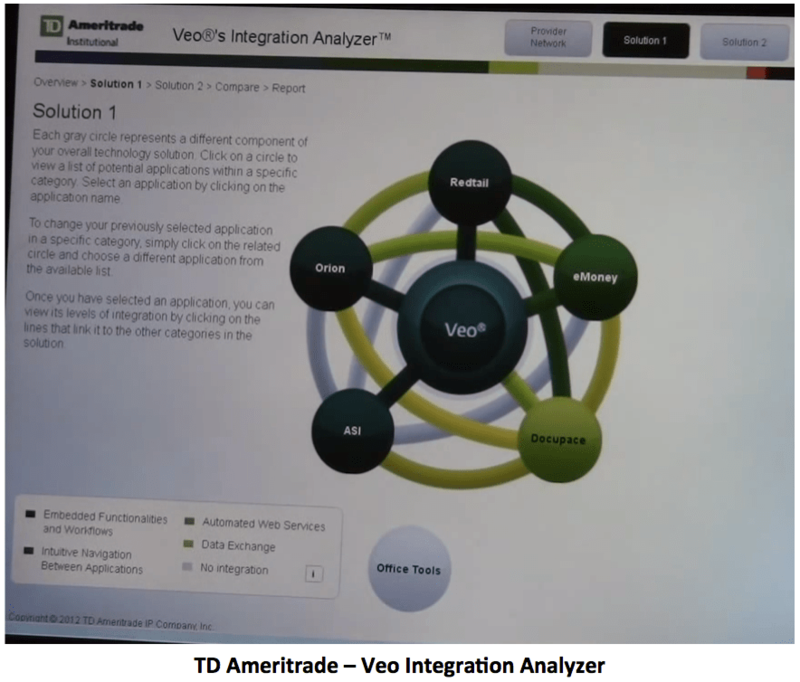 TD Ameritrade’s account management and trading platform, called Veo, is integrated with 85 different third party applications. This includes CRM, financial planning, portfolio management, document management and other programs. Veo provides single sign on (SSO) support that requires an advisor to only enter login information one time no matter how many applications are being accessed. One of the features that Veo offers that I find extremely helpful is their Integration Analyzer. This tool allows an advisor to select products from different categories and see the level of integration available when they are used together. The interface uses color-coded circles (see screenshot) to show the level of integration supported. Lighter colors are less integrated while darker colors mean tighter integration. It makes it easy for someone without a technical background to understand which applications would be a good fit with each other. Pershing’s custodial system is NetX360, which they refer to as an open-architecture, business-to-business platform. It combines what were formerly separate applications for clients of their legacy brokerage, managed accounts and prime brokerage services. NetX360 is the only custodial application that runs on Microsoft’s Surface tablet. Microsoft only has about 2% of the tablet market, but their sales are up. 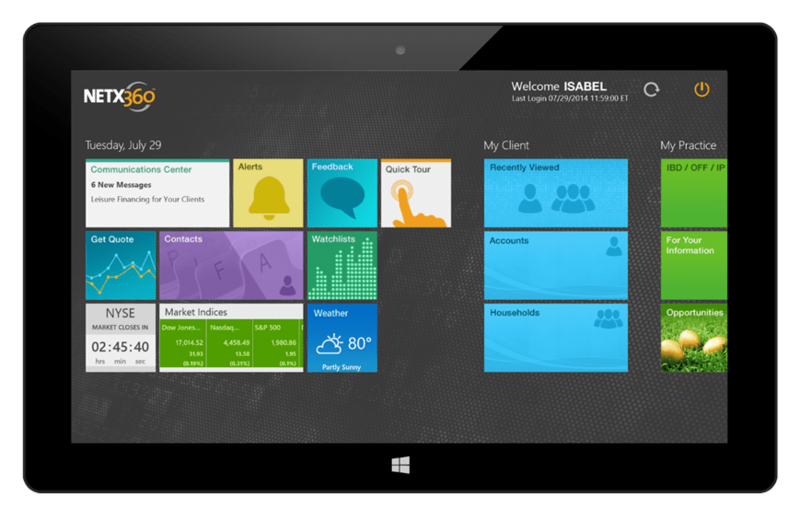 It would be a good option for advisors that use Windows 8 and want the same user experience on their tablet. There are also other systems that are also vying to own the advisor interface. Systems that you would not expect to be in this position and did not even exist three or four years ago now are making a strong case to be the first step in the new client process. 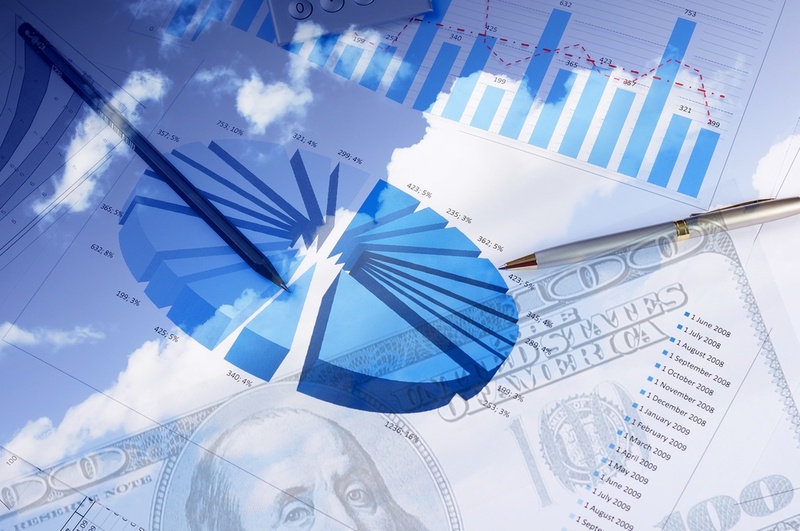 These upstarts include technology vendors such as Riskalyze that built a sophisticated tool for analyzing portfolio risk. Their marketing pitch is for advisors to “start the conversation [to prospective clients] with risk”. Their software includes not only portfolio risk analysis, a detailed risk tolerance questionnaire and portfolio stress testing, but also lead generation and proposal tools. I like the way that the Riskalyze team is approaching the problem of prospect conversion rate. An advisor will always prefer to have reports that show how a client’s current portfolio is bad and their proposed portfolio is good. 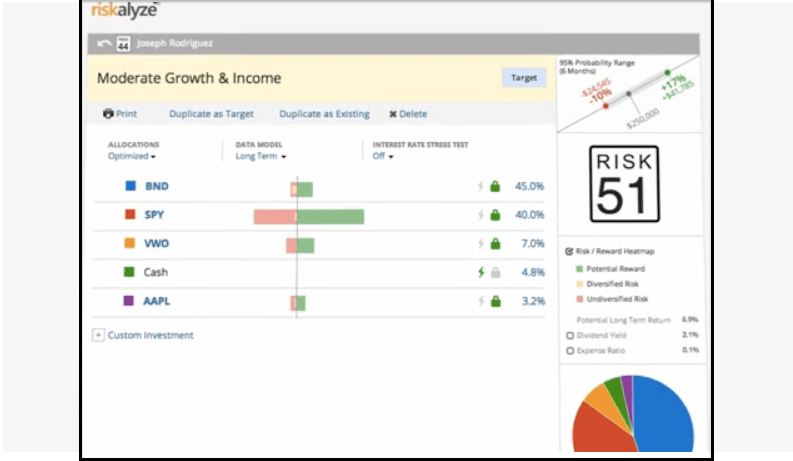 Riskalyze reports give the advisor the ability to show a prospect how their current portfolio is out of line with their own expectations of risk. Riskalyze does a good job of distilling this complex information down into some very eye-catching graphics and easy-to-understand charts. They hope to squeeze their way into the portfolio construction process as well, by recommending investments that best meet the new client’s appetite for risk. Riskalyze claims to provide drag-and-drop “integration” with 25 custodial and RIA platforms. I find this use of the word “integration” to be suspect when you have to qualify it with “drag-and-drop”. This might hold them back from gaining greater traction with larger RIA firms that have come to expect tighter integration between their applications. Who Will Win The Battle to be the RIA Technology Integration Hub? The battle to be the RIA technology integration hub had become one of the most furious contests in financial advisor tech. While CRM providers like Salesforce claim that they can be the central control point and filter data from other sources, financial planning tools like eMoney Advisor have spent heavily on building integration to as many other applications as they can to provide a seamless experience for advisors. The combatants for the RIA technology integration hub all want to rule the world. At least, the world that advisors view and manage their business through. 2015 will be a dynamic year for wealth management, as advancements in financial technology continue to topple industry conventions. This is the time to focus on the market trends that will best position new advisors to capture assets with the coming inter-generational transfer of wealth.